This week we were all supposed to have been celebrating British Curry Week. Missed the fun? Me too. I did have one good Indian meal, though. And some of it was curry. I ate at Simla, on the Quayside, which Tripadvisor says is Newcastle’s #1 restaurant (out of all 1,017 in the city). That statistic alone probably disqualifies Tripadvisor from claiming any shred of credibility. 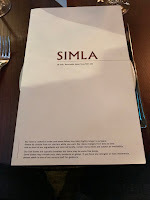 Simla, though enjoyable, isn’t the best restaurant on the Quayside, let alone in the whole of Newcastle. Anyone with a taste bud knows that House of Tides, our city’s only Michelin-starred restaurant, comfortably holds both positions, yet TripAdvisor’s ‘critics’ rate it down at #16. 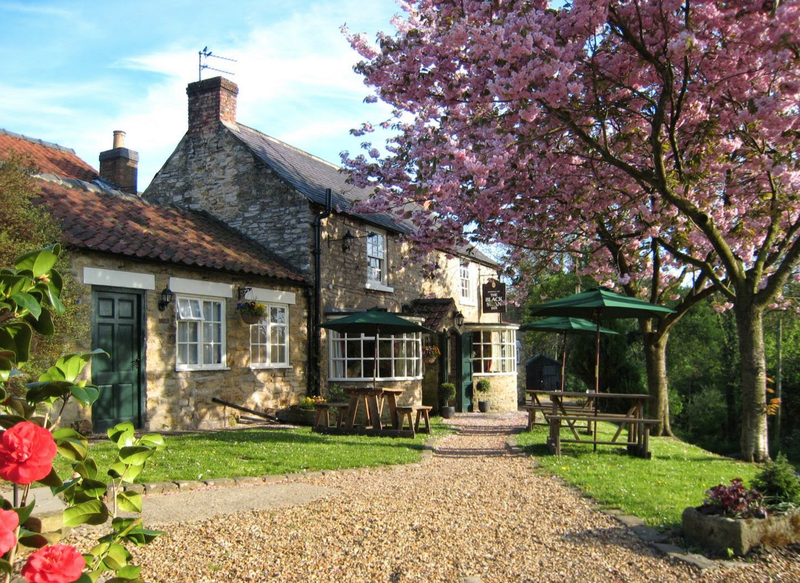 But then, Tripadvisor just declared a gastropub in North Yorkshire the best restaurant in the world, which is ludicrous. 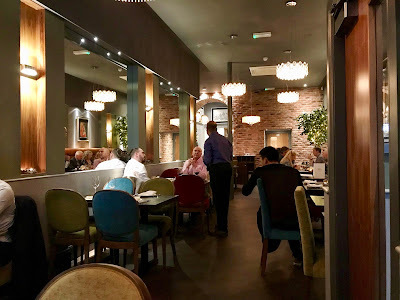 I absolutely love The Black Swan in Oldstead, even gave it 6 stars (and Michelin gave it one), but I doubt even the closest friends of chef Tommy Banks think he’s that good. 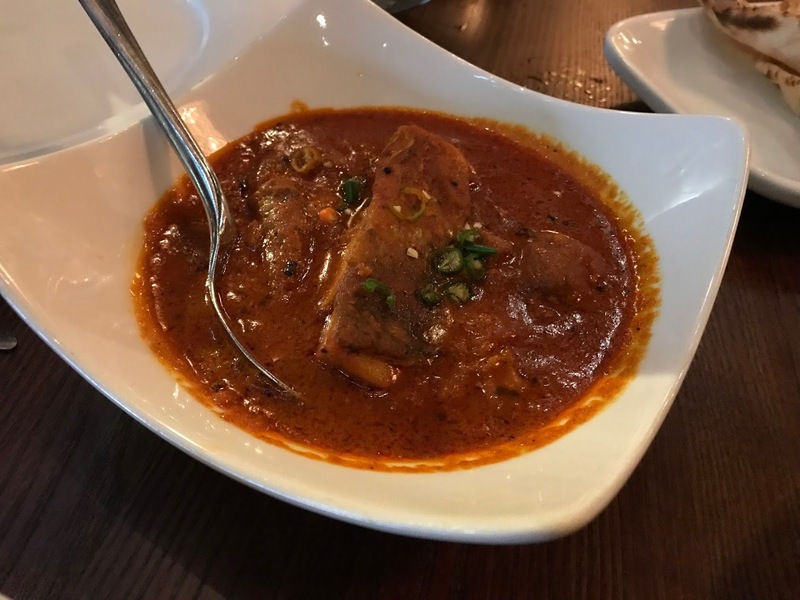 Public approval means almost nothing when it comes to Indian restaurants, for the vast majority of the population knows almost nothing about Indian food. 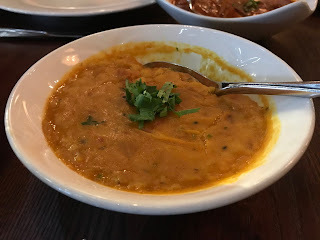 As if to prove the point, this week there was a report that korma, that insipid, creamy yawn of a dish (which is nothing like the real Indian deal), has replaced chicken tikka masala, an equally dreary and entirely British creation, as the most popular dish in our curry houses. 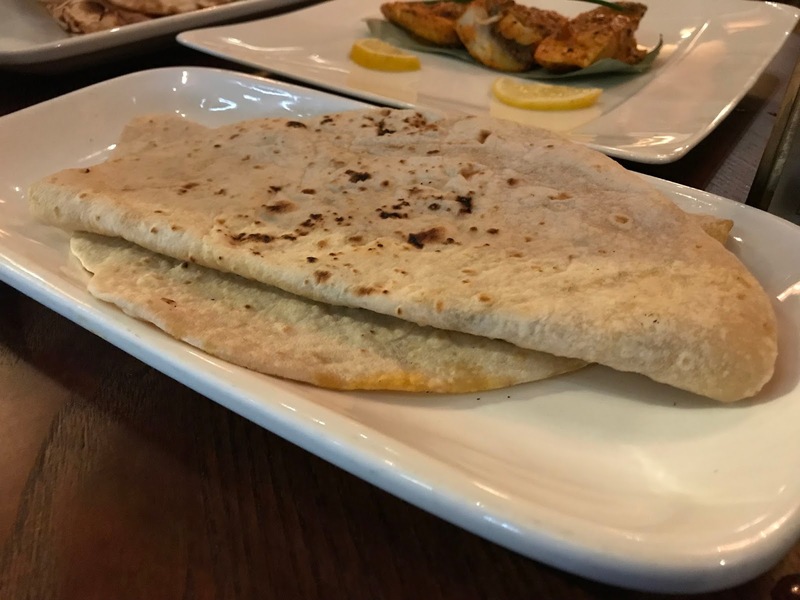 Most Brits wouldn’t know a decent curry if it was slapped around their faces with a hot chapati. However Simla, if not quite the best, still turned out to be pretty good. For a start, although small, it has a welcoming, relaxed atmosphere, all warm lighting, tasteful modern art and good music. Equally warm was the service. 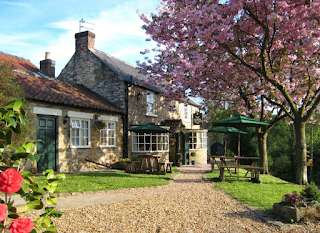 We were well looked after by a succession of charming and enthusiastic staff, including the son and grandson of the original owner. It’s been around since the 1980s, but only recently refurbished. They now have a good chef called Kaushik Sharma, whose spicing is largely spot on. We started with crisp French sauvignon and, to go with our pre-prandial chat, chaat snacks (£3), both Bombay and pani puri. The latter weren’t quite right. 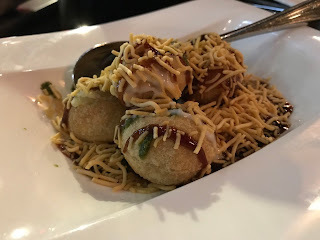 Pani puri, little puff balls filled with spiced vegetable mixture, are supposed to be topped up with spiced water (pani means water) so that they explode like flavour bombs when you pop them whole in the mouth. 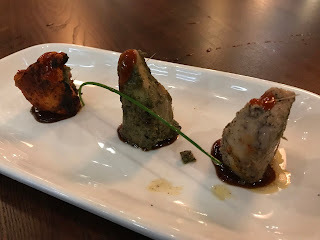 They forgot the water, so these were just cold potato balls. 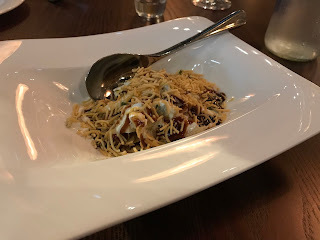 However, the chaat itself was excellent: a gloriously tangy, fruity, sweet mishmash of puri, fried noodles, more spicy bits, tamarind chutney and yoghurt. From a short but interesting menu full of good ideas, we chose three starters. 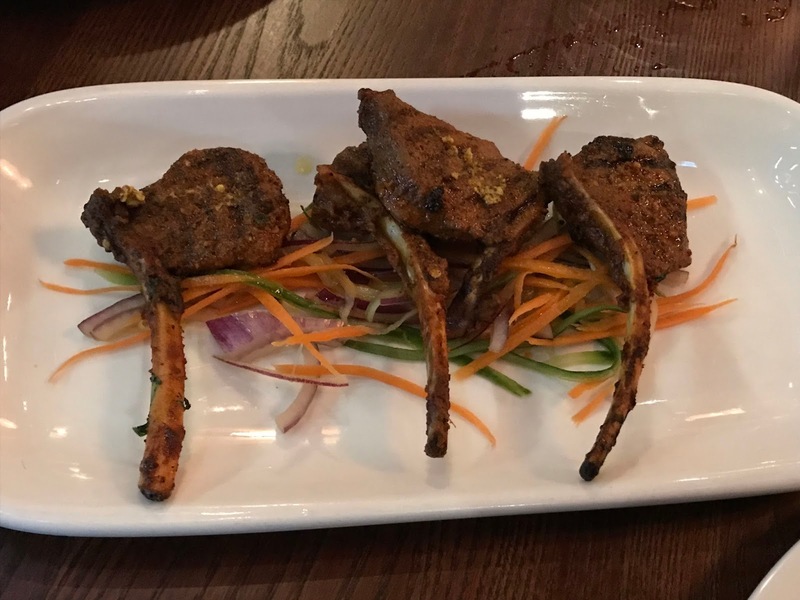 Lamb chops kasundi (£9.50) were tiny (good) but overcooked to greyness (not so good), which almost gave them a texture of ground lamb. The meat had travelled from New Zealand, which can’t have helped, and any flavour was also masked by an overly strong mustard dressing. Scallops were properly tender and came dressed with marinated red onion and a light chilli and garlic sauce. 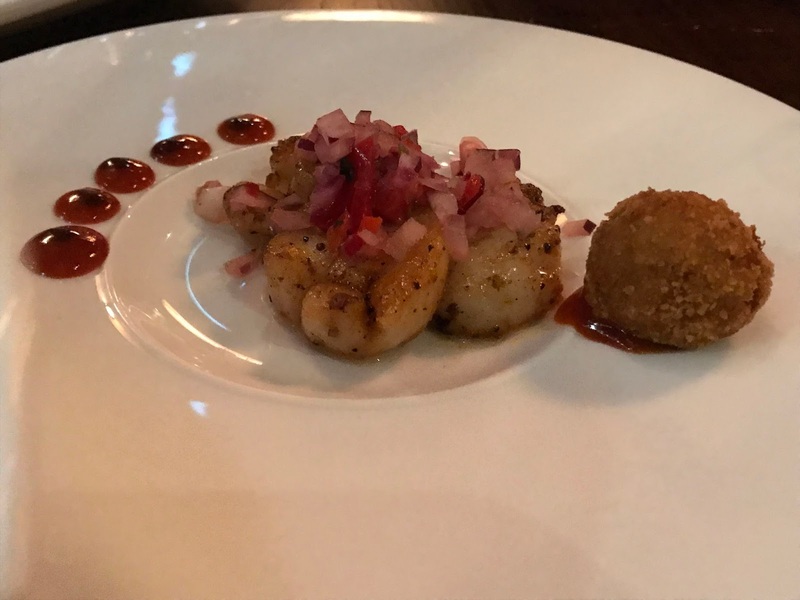 There was a strange little dry ball of potato on the side. Out of greed, we went overboard with a trio of chicken tikka (£5.50), kebabs done three ways, none of which were particularly good. The chicken didn’t taste as though it had been anywhere near a tandoor, and was rather dry. However, our meal took a sharp turn for the better with three very good mains. Goan fish curry (£13) was first rate, seabass swimming in a sauce that was red, dark and full of heat. I wrote down “authentic” on my notepad, which is pretty much the highest compliment in my Indian food vocabulary. 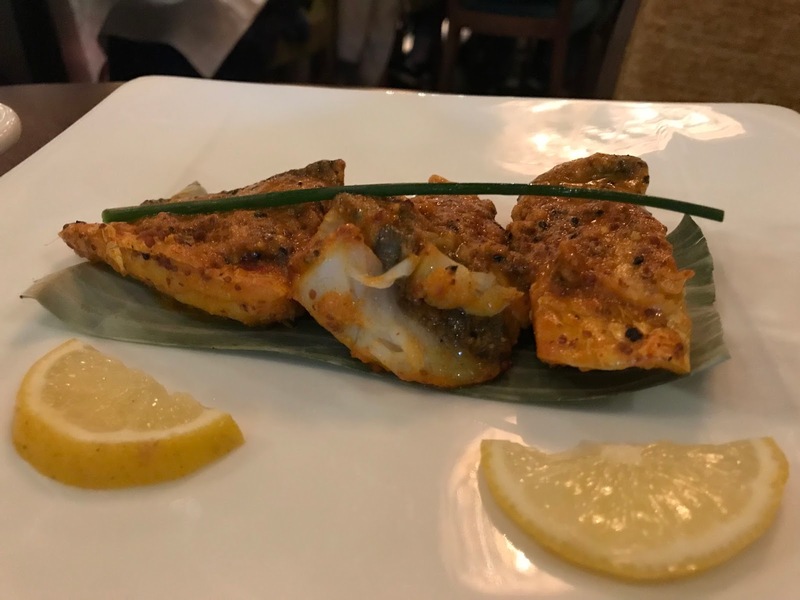 Bengali mustard fish (£14) was a revelation – seabass again, cooked in a yellow paste of mustard oil, turmeric, nigella and coriander, and served on a banana leaf. 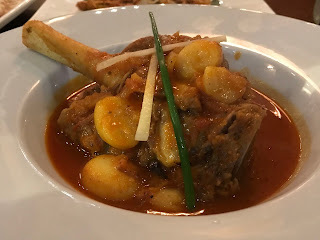 The highlight of the night was a fine lamb rogan josh (£15.50), that ubiquitous Kashmiri classic. This was a large shank, long in the marinating and even longer in the cooking, which had a lighter sauce than usual, but was very tender and flavourful. I thought I detected star anise, cinammon, cloves and chunks of fresh lemongrass alongside the (presumably) Kashmiri chillies. Each sauce here seems to be made freshly and separately, unlike the usual curry house mix and match. Chapati and roti were fine, but our two vegetable sides were very poor. ...and a tired aloo gobi was left virtually untouched. I really should mention the gulab jamun in case any of you order it. Don’t. 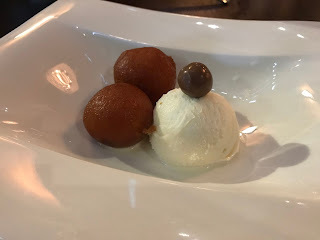 Two oily balls of milk sponge and syrup, neither light nor soft, were accompanied by a boule of almost tasteless vanilla ice cream bizarrely garnished with a Malteser. Luckily for Simla, our main courses alone justified their four stars. 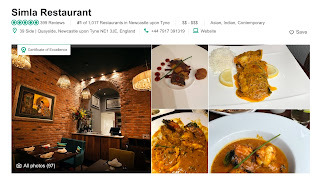 I do recommend this place, particularly for the family-run atmosphere. Along with the bill for £106 (for what really should have been three people), we were presented with some After Eight chocolates. Quaint. “Shall I look it up on Tripadvisor?” suggested Mrs Diner. The four star rating appears to be a little out of sync with the review. 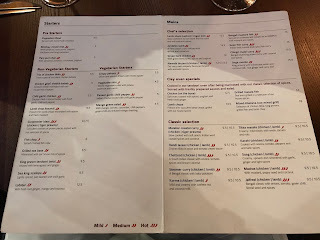 Three very good mains but a lot of other dishes that seem to have been fairly grim. I might stick with Ury for the moment. 4 stars is "highly recommended" and I stand by that. 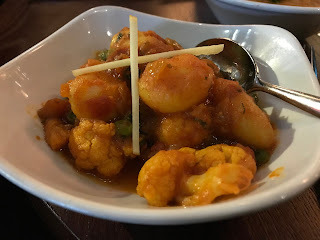 The scallops and chaat were very good too, and the main courses among the best I've enjoyed in the city. I'm glad to see you're a fellow Ury supporter, though. I love their masala dosa, and nothing beats their kingfish - especially with the amazing black eyed beans in yoghurt on the side. 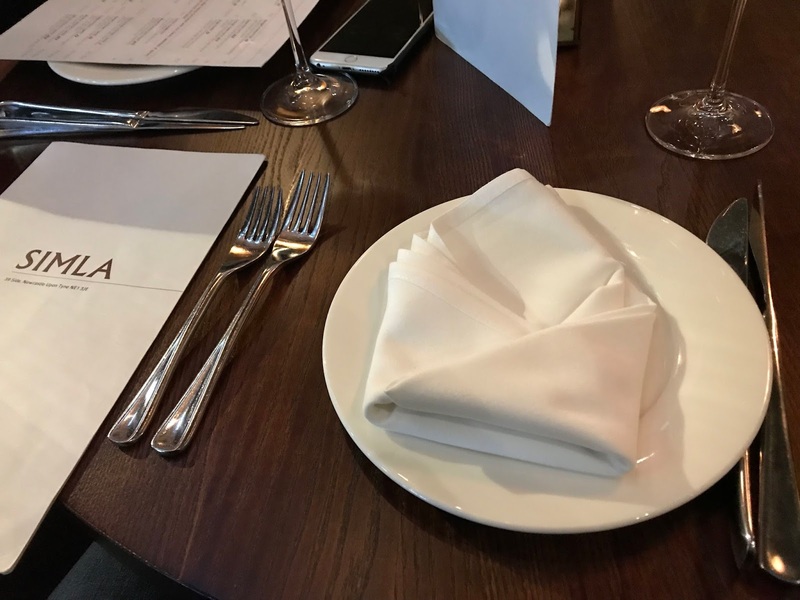 For good food and great staff Simla is our local choice for our curry night out squad of ten. 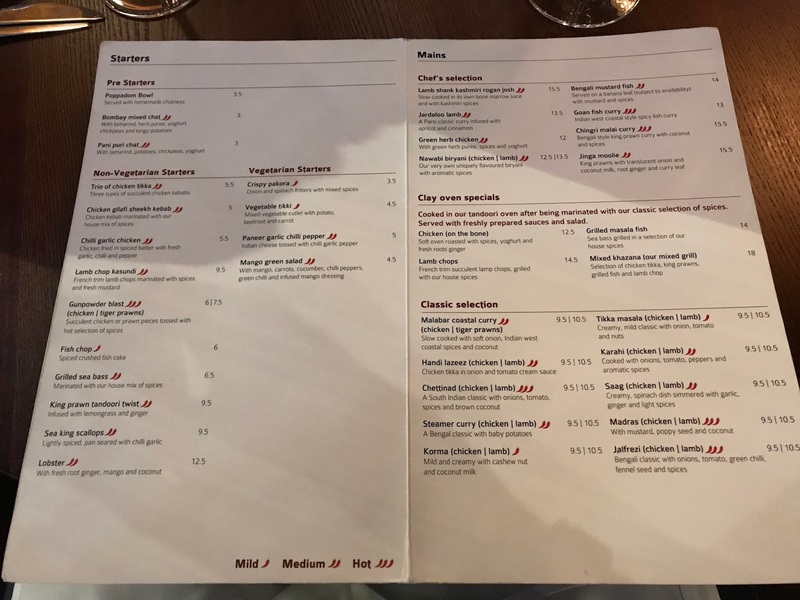 Always up for changing a dish to how you like it, and great value for money. I'm a lamb fan and it's always perfect.